I currently reside in Wisconsin. This means that there are about 4 months out of the year with ideal riding weather. The rest of the year I need to make modifications to continue my MTB habit. One of the modifications for dealing with bitter cold is finding a solution for keeping my hands warm that still allows me to shift and brake normally. One of the most popular ways of achieving this is with Pogies, Barmitts, Handmitts, they go by a number of names, that fit over your bars and provide an all-encompassing insulating layer. With this outer shell of protection you can then wear light or even summer gloves that give all of the normal feel and grip on the bars. Usually, these barmitts cost anywhere from $70-$200. Meaning that only the most dedicated winter riders invest in these devices. But, I discovered a source that provides a similar feature set at a fraction of the price. Enter the “Kwik Tek ScootR Logic SLHM-1 Hand Mitts.” Don’t let the Amazon product shot dissuade you. Even though these are marketed toward motor scooter riders they feature a very similar construction to standard mountain bike pogies. The “Kwik Tek ScootR Logic SLHM-1 Hand Mitts” (I love repeating that product name) are constructed from 600-denier waterproof polyester and have an insulated layer. When I pulled them out of the box they felt thin, but as I will note later, the warmth is definitely there. All of the stitching seems sturdy and held up well to me laying my bike down on ice multiple times when testing. In regards to mounting there are two adjustments that can be made. There is a main velcro strap that is used to attach the mitts to your bars. Next to this strap, there is a slit along the side of the mitt. This slit can be velcroed together. It serves two purposes. First it makes the opening large enough to allow easy installation over brake levers, shifters and any other bits and bobs you have on your handlebars. Secondly this slit allows you to make a custom opening for your brake and shifter cables without having any cable pinch when you cinch down the main velcro strap. A simple but effective cable routing solution. As I mentioned I was a bit skeptical if these mitts would really be thick enough to provide much warmth. My first ride out I wore some medium weight gloves on a 20 degree day. By the end of the ride my hand were sweating. Needless to say I was impressed. My next ride I swapped out the medium weight gloves for my regular fox riding gloves. My hands were perfectly fine with this setup. During my test period I got to ride these in subzero (fahrenheit) conditions as well. With some medium weight gloves, that still give me good lever feel, I was completely comfortable. 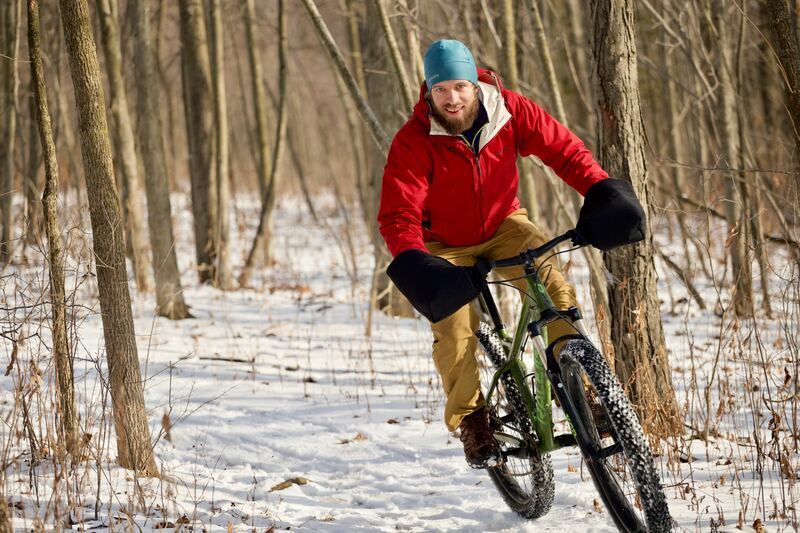 I’ve also ridden these mitts in snowstorms and they kept my hands and gloves pretty much dry. The openings where you insert your hands are not adjustable so a little precipitation can sneak in. As far as fitting the mitts to the bike goes, I found that it was a bit of a trial and error process to figure out the right way to route everything and cinch down the velcro in order to avoid having the mitts slide down the bars. But, with a bit of practice, I’ve mastered installing them well. A common concern when riding with bar mitts is that you won’t be able to pull your hands out if you crash or need to bail off your bike. Winter riding means more crashing so I was able to test this out. I found that I had no trouble getting my hands out in an emergency situation. After getting used to the sensation of having something around my hands I felt no less safe that when riding with regular clean bars. At $17 I’d say these bar mitts are hard to beat. Sure they might not be quite as fancy as something made by a boutique brand. They don’t have fancy closures or attachments points. But let’s face it, for most of us bar mitts are really only needed on 20 degree or colder days. These aren’t something you are going to use every day, year round. So unless your middle name is “Sasquatch” I found these mitts to hit all the marks in ease of use, value and warmth! I'm a mountain biker currently residing in Montrose, Colorado. I love riding bikes with my family and friends, race casually and am plain crazy about bikes.